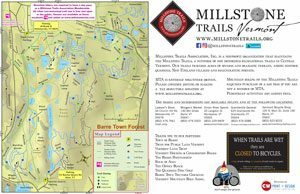 We want you to have a great time on the Millstone Trails, know where you are, and be able to effectively plan your visit. To help you, our maps are available free of charge. Printed maps are available wherever our day passes are sold, as well as at the Barre Town Offices. To take our maps in your pocket, we highly recommend following our trails on TrailHUB and downloading the TrailHUB app, for a fully enriched, GPS-navigable experience. Never get lost at Millstone again! For trail status (open/closed/caution), current conditions and more, visit our Trail Conditions pages and follow us on TrailHUB! 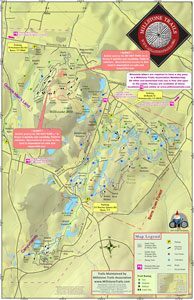 We also invite you to check out our interactive online map below, and to visit our “Meet Our Trails” pages for a narrative overview of what you can expect to find at Millstone. Want the kmz file for this map? Here you go!